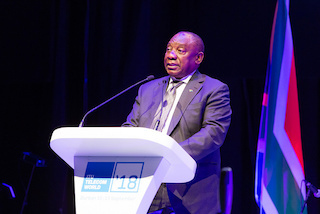 2600 delegates attending the ITU World 2018 conference listened intently as President Ramaphosa spoke of the dawn of the digital revelation that is rising on the African continent at the ITU World 2018 on the 10th September 2018 in Durban. “We are at the dawn of the digital revolution that will reshape the way we work, the way we live and the way we relate to each other”, said the President. He said that we should celebrate the opportunity South Africa has in being part of the ITU World 2018, not only to learn and share, but to use the technology in solving our own issues for our people. “It is equally critical that both government and industry develop effective collaborative relationships with the communities they are both expected to serve.” Also, the President stressed that the digital divide that exists for so many people, must be narrowed and not widened and that connectivity must be available to all people, irrespective of where they are located. Let us hope that this comes true sooner than later. 20 Million South Africans do not have access to the Internet. Even though 87% of all households have cellular phones – so the infrastructure is mostly available, but the last hurdle to get these people connected needs to be better understood and overcome. So, this all sounds good, but I do hope it happens faster than everything in the past. Must bridge the digital divide and not widen it. It was a positive message from the President, a lot seems to be in motion already and we only need to wait and see if the people tasked with all these important tasks, get the jobs done. My gut feel, and this is rather early as we are only one day into the 4-day conference, is that Government has realised the benefit of getting everyone connected and are going to be more responsive to requests and licensing issues from private stakeholders – but the Government is wanting the big private stakeholders to do most of the work and heavy carrying. The likes of MTN and Huawei, both of which are major sponsors of ITU World 2018. How does this affect lawyers? Signing out for now, but the next few days should prove quite interesting.